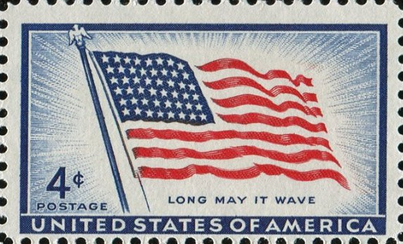 A 1957 stamp showing the 48-star U.S. flag in use from 1912 to 1959. For more information regarding Arizona’s star and its association with Independence Day, please see https://www.facebook.com/photo.php?fbid=409877605794905&set=a.342266935889306.81247.221135871335747&type=1&theater. Phoenicians celebrated July 4th, 1912, Arizona’s first post-statehood Independence Day, with a parade, a feast, outdoor games, a concert, and a late-night dance. As reported in the July 5th, 1912 edition of the Arizona Republican newspaper, there was also a “patriotic talk,” but, “not maddening noise and wild and senseless hurrah.” The talk referenced was given by George P. Bullard, the state’s first attorney general. Bullard’s address, memorialized in full on page five of the following day’s Arizona Republican, began with a section reminding those listening, “This Fourth of July is of especial interest to Arizonians and every Arizonian’s heart should swell with pride because today [from] every national building, from every reservation, from every fort, from the mast of every American vessel in all the ports of the civilized world there will break to the breeze for the first time the beloved flag of our nation emblazoned upon its field of azure blue the forty-eighth star, the star of Arizona.” However, Bullard’s discussion of the Grand Canyon State’s symbolic presence on the American flag seems to have been trumped in importance — at least in the minds of the paper’s reporting staff — by the large feast made available to the many revelers in attendance. As exclaimed by a front page newspaper headline the following day, “Phoenix Had Best Fourth.” Notably, the city’s first post-statehood 4th of July observance included a food spread of a size, “never before witnessed in [that] city.” Indeed, the gleeful and likely sated reporter proclaimed, “if the barbecue alone had been the sum and substance of the day’s events, the affair would have been a success.” What merits this praise, you ask? A feast consisting of “one and a half beeves, 547 loaves of bread, eight hams, two barrels of pickles and quantities of olives.” How does that compare to your planned menu? Regardless of whether you’ll be sitting down to hot dogs and hamburgers or sharing a meal of “one and a half beeves” with a large group of friends and neighbors, Happy 4th of July!